Election Day is here! Polls are open until 7 p.m. in Illinois. Election Day is here. Finally. One example: Nikita Richards, the Democratic candidate for McLean County clerk, announced her run for McLean County clerk on June 29, 2017. That’s 495 days before Election Day. But Election Day is finally upon us. Here’s a look at the races and storylines GLT will be tracking as polls close at 7 p.m. Tuesday. Stay with WGLT.org all night for live results, candidate reaction, and analysis. Follow us on Facebook and Twitter for the latest updates from our news team. McLean County is historically red. Republicans hold a 15-to-5 majority on the McLean County Board. All countywide elected officials are Republicans. All locally elected state lawmakers are Republicans, including the Senate minority leader. But McLean County Democrats are energized this cycle, with new leadership and a huge slate of candidates—including many women running for the first time. They’re hoping for Richards to defeat incumbent Republican County Clerk Kathy Michael. Richards would be the first Democratic clerk in county history. Democrats might also chip away at that 15-to-5 GOP majority on the County Board. If all of the Democratic candidates win—no easy feat—the balance of power would fall to 11-9 Republican. And that’s only if Shayna Watchinski and David Parker keep Districts 8 and 9 in Democratic hands. The county clerk typically isn’t a high-profile race. But boy has that changed this time around. Michael-Richards is arguably the marquee matchup on Election Day locally. Richards’ candidacy represents a shift in strategy and aggressiveness among local Democrats, who are seeking to knock off one of the community’s most well-known Republican incumbents. The McLean County GOP is also operating under new leadership. They’ve leaned on two main talking points in recent months—that “Cook County” Democrats like billionaire JB Pritzker are funding McLean County Democrats, and they want to keep “Chicago-style politics” out of the community. Rauner and Pritzker: How Will They Do In McLean County? Republican Bruce Rauner is seen as one of the most vulnerable governors in the country. Pritzker leads in the polls. Conservative Sam McCann and Libertarian Kash Jackson are also running. Rauner narrowly survived a March primary fight from Jeanne Ives. But his margin of victory over Ives in McLean County (53-46) was bigger than it was statewide (51-48). How will he do here Nov. 6? Pritzker won the Democratic primary handily. But he actually lost McLean County to Daniel Biss, who won 45 percent of the vote here. Pritzker has campaigned in Bloomington-Normal several times. 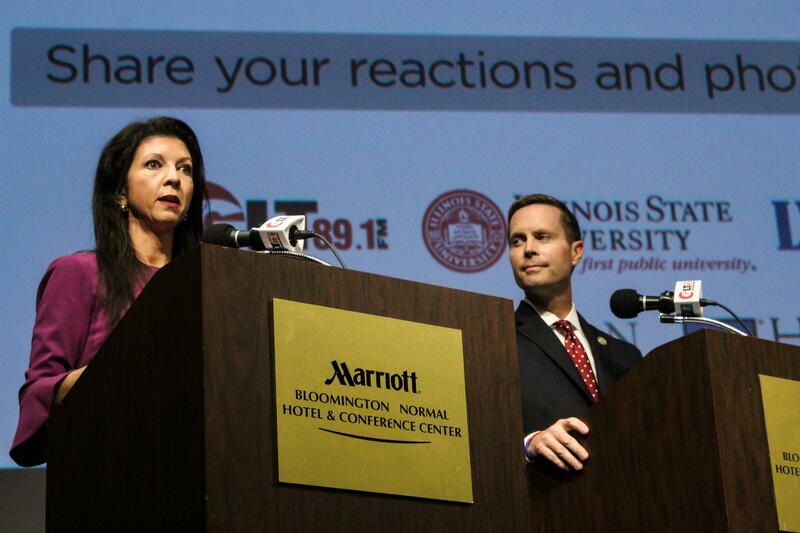 Democrat Betsy Dirksen Londrigan with U.S. Rep. Rodney Davis at the GLT debate on Monday, Oct. 29, 2018. The 13th Congressional District is one of the most closely watched races in the country. Democrats need to flip two-dozen seats to take the House, and they’ve made Rep. Rodney Davis one of their top targets. Democrat Betsy Dirksen Londrigan of Springfield has attracted huge out-of-state support. Londrigan has run primarily on health care, accusing Davis of trying to dismantle the Affordable Care Act and harm those with pre-existing conditions. Davis says that’s a lie. He claims he’s delivered results to his constituents, including passage of the 2017 tax cuts. The sprawling 13th District includes parts of Bloomington-Normal and several other college towns, plus rural areas. It was gerrymandered by Democrats to give a Democrat a chance to win. Bloomington voters will decide whether to dissolve the Bloomington Election Commission, which would shift election administration in the city to the county clerk’s office. The clerk already handles elections for everywhere else in McLean County, including Normal. Libertarians and Republicans teamed up to get the question on the ballot. They say having twin election authorities is inefficient and potentially confusing. Democrats fought unsuccessfully to kill the ballot question, saying they don’t want to dissolve the BEC without first taking steps toward the creation of a countywide election commission to replace it. Democrats say they’re opposed to handing over election duties to the elected county clerk—currently Kathy Michael. One wrinkle: The ballot question is oddly worded. It asks: “Shall the city election law be rejected?” At least one expert GLT interviewed said that may prompt some voters to skip over it. 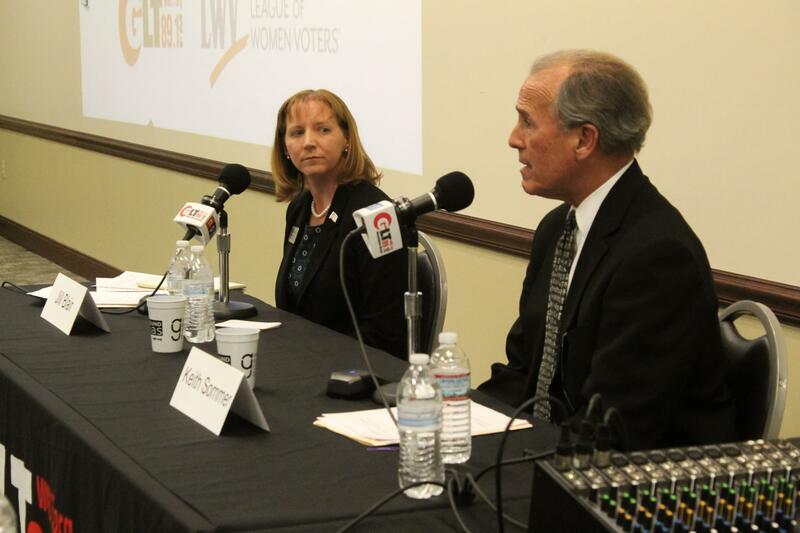 Democrat Jill Blair with state Rep. Keith Sommer at their GLT debate earlier this month. Republican State Rep. Keith Sommer faces Democrat Jill Blair of Bloomington in the 88th House District. Blair, who is Sommer’s first general election opponent in a decade, said she wanted voters to have a “choice for a change.” GLT has reported that Sommer is one of the quietest lawmakers in Springfield, keeping a low profile with few signature achievements in the 19 years he’s been there. Blair has been endorsed by the Peoria Journal-Star and the Chicago Tribune. We’re also watching the other Illinois House races in McLean County: State Rep. Dan Brady versus Democratic challenger Ben Webb, and Republican Dan Caulkins against Democrat Jen McMillin for a seat held by retiring state Rep. Bill Mitchell. The McLean County Libertarian Party took advantage of the lower ballot-access threshold it earned in 2016 by fielding a larger slate of candidates this time around. There are Libertarian candidates in seven of the 10 County Board races. And Libertarian Lex Green is challenging incumbent Republican County Treasurer Rebecca McNeil. Green needs to secure at least 5 percent of the vote for Libertarians to ensure ballot access in 2020. “This is a good thing for me in that even if I lose I win because I am advocating for the Libertarians and the cause that I believe in,” Green told GLT. Find all of GLT’s election coverage WGLT.org/Election.